We stayed in the Chalets, lined up on the left of the photo an and ate meals in the building in the background. 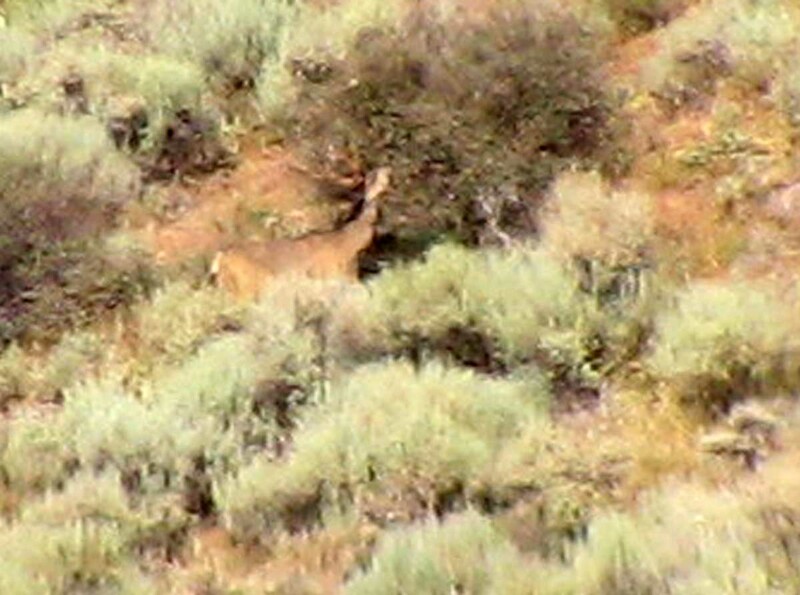 Red stags were pretty easy to find. The hunting took place inside a four thousand acre enclosure. 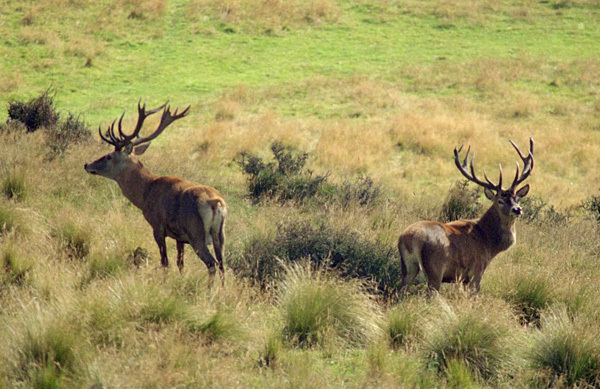 I’m not sure what the density of stags was, but there were plenty. On my second day of hunting, I wounded this stag with my bow and arrow. I was successful with a follow-up shot from the guide’s 7 mm mag and finished him off from 200 yards. I was disappointed that I flubbed the shot, but happy to bring home the trophy. The trophy fee for this silver medal stag was $3,000. Although he may have scored in the gold metal category, the guide told me he was silver before I shot him and he stood by that fee. Keeping price in mind, I passed up a chance at a chamois and also a fallow deer with trophy fees of $2,000 each and settled for this feral goat which cost only $500. 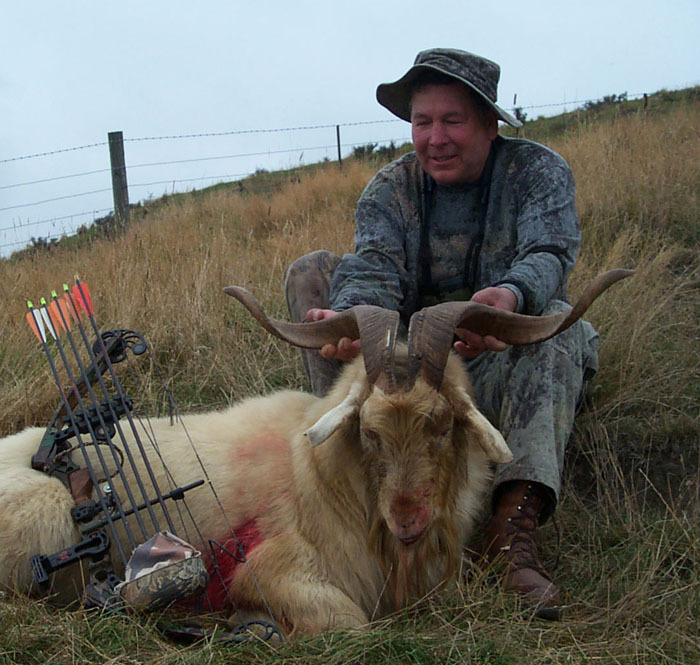 After repairing my bow, I still hunted for this goat and stayed within my budget. I’ll have to find a chamios and fallow deer someplace else. Maybe they’ll be in my budget next year. 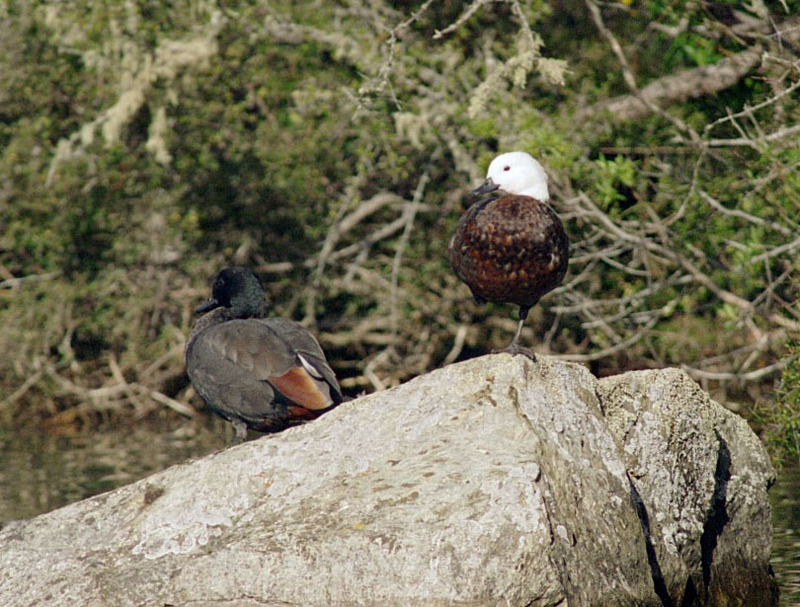 The paradise duck is a very common native to New Zealand. These two were resting in the sun at the pond where I fly fished for trout. 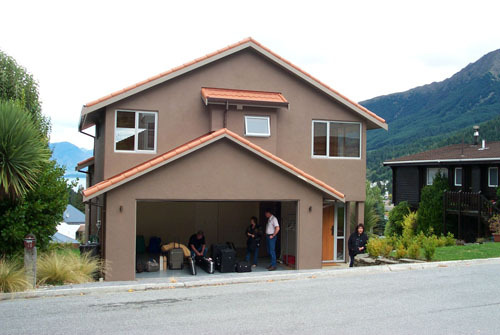 During our stay, six of us spend a week in this nearly new Queenstown home. The view of the city and surrounding area was beautiful. The weather was mild and sunny. 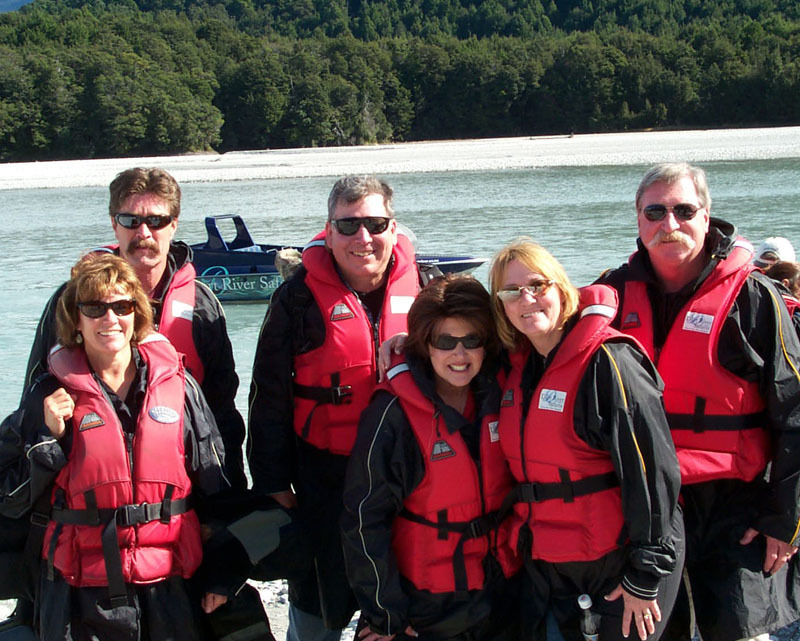 Left to right: Our group included Pat and Jerry Lowery, myself and my wife Linda as well as Linda and Hal Stauff. Here we ready oruselves for a jetboat ride up a small river. Linda also parasailed from a nearby mountain. 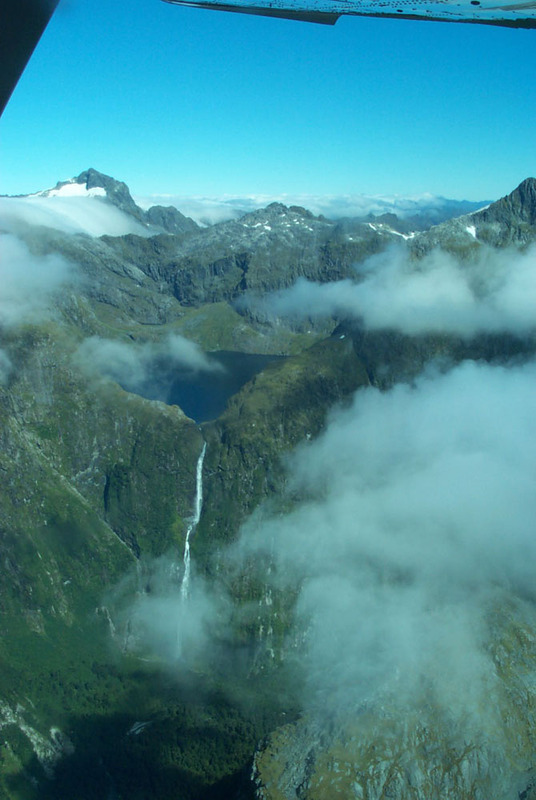 In this case, the photo explains more than I can say about the beauty of these mountains, called the New Zealand alps. 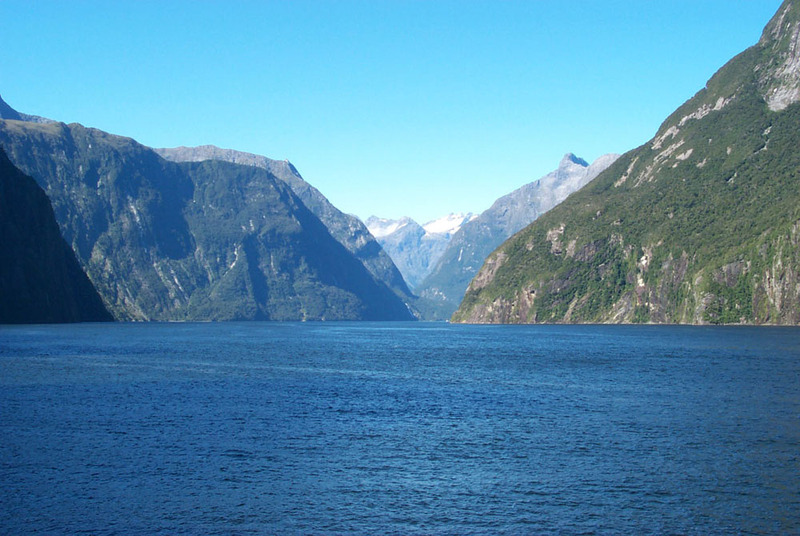 Milford Sound is located on the west coast of New Zealand’s South Island and is reachable in one day from Queenstown by small plane or bus. 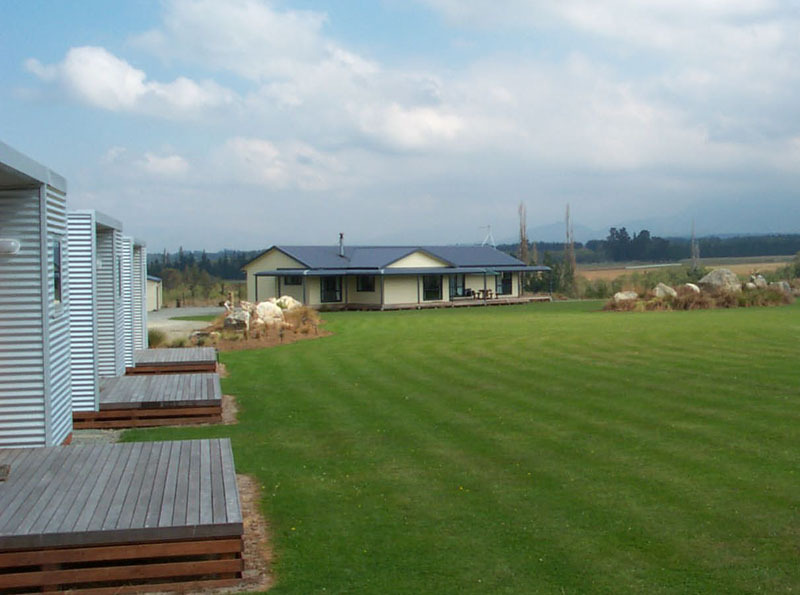 It’s a popular destination for tourists visiting Queenstown or other southern New Zealand resorts. 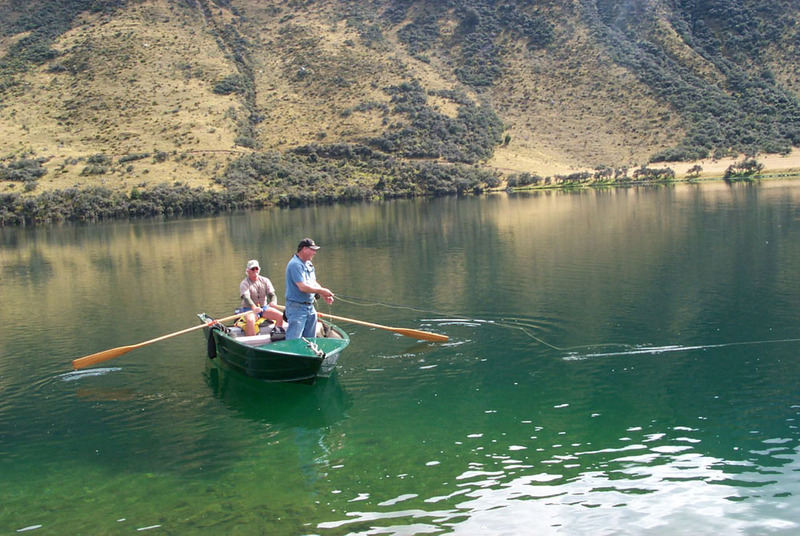 Although I caught no fish, this pond was a very nice place to fish. Linda took the photo while she observed from shore. 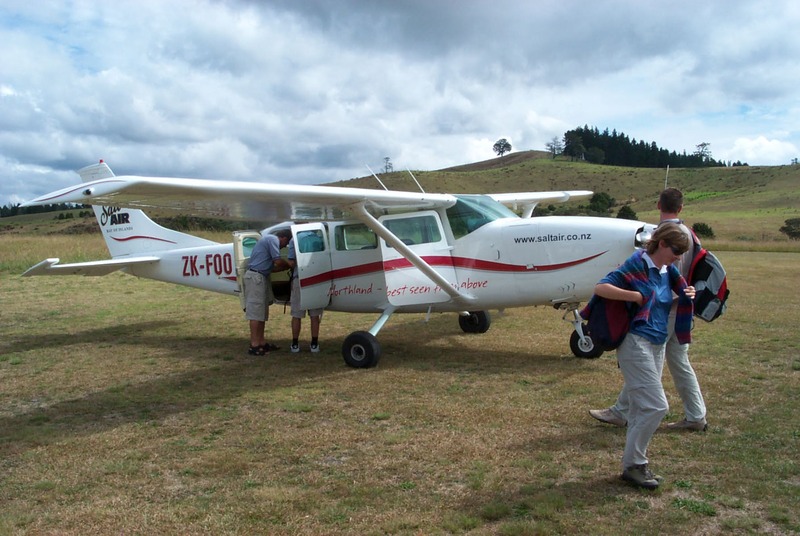 As we had done in Queenstown, we decided to tour the North Island by air. It was worth the cost. 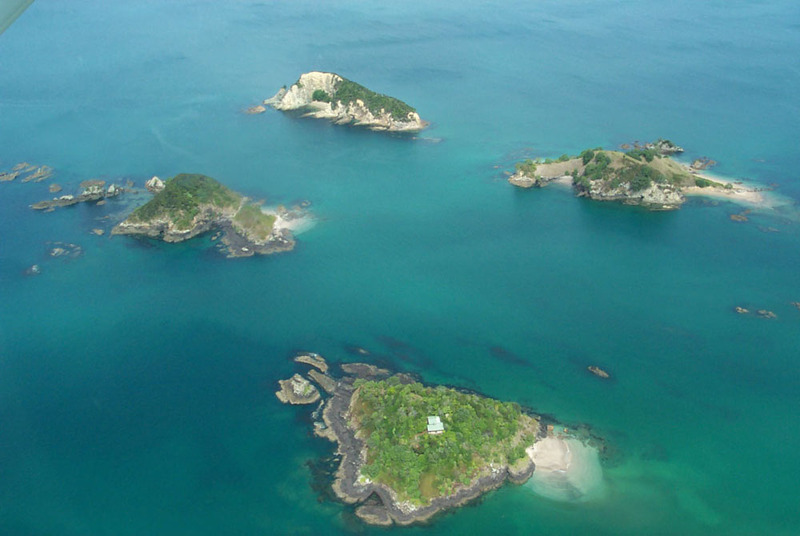 These islands were located on the East Coast of the North Island in and area called The Bay of Islands. We spent a couple days at a bed and breakfast nearby. It was a slow opener at Mayberry Farms. Just didn’t have the number of ducks that usually show. Could have been due to the way we managed the club in September, but more likely it was simply due to the ducks not being in our area. Funny how ducks move around. We try to understand why they are sometimes there and not at other times, but it’s such a dynamic system. We shot almost all mallards, totaling 28 between five of us for two days. This is about half our normal opening weekend total. But, it’s hard to complain about a couple days in the marsh hunting ducks. Saturday, on her second opening day, Lola got off to a slow start by not retrieving the first few ducks we shot. She did find them and keep them at bay (yes actually barking at a couple of them). She got redemtion on Sunday. After a greenhead went down about 20 yards into a dense cattail patch, she came out with the bird in her mouth and I was satisfied that we’ll turn things around soon. She’s hot to hunt, but shy around the dead ducks – same as last year. Who knows what goes through a dogs brain. Checked the water at Mayberry Farms today. Opened the gate valve on one syphon and had to set up the vacuum pump and reprime the other pipe, but the real news was that the weather finally turned to autumn and not only that, but the ducks were flying. With the wind gusting to over 20 mph and the temperature in the 50’s, it seemed like duck season. For the first time since we started flooding up, mallards were working our ponds, and not just a couple of ducks. They were on all the ponds – flirting here and there and finally landing. I took Lola for a walk and she chased up a couple roosters that would have been in range…..got my blood pumping. This is good news. The last couple trips over to check on the water had been a little disappointing as the ducks didn’t seem to be responding. It’s not unusual for the ducks to disappear right before the season opener as duck clubs flood up and opportunities to loaf increase. After today I’d have to say that propects for next weekend are looking good. Call it old age and memory loss or whatever you want. I cannot prepare for a lengthy deer hunt anymore without preparing a checklist. Therefore, I keep a checklist from each hunt saved on my computer. That way I can just revise it for the next hunt. Here’s a draft of my next checklist prepared in advance. Check it out, it may help you formulate your own list. Feel free to let me know what you’d add – I’d be interested to know. I won’t necessarily take everything on this list, but I leave everything on the list and just cross off the stuff I won’t use. That way it will be on the list when I remake it for my next hunt. Some items will be provided by the other guys on the hunt and I’ll cross them out as well. This system does a pretty good job of preventing me from leaving key items behind, but nothing is fool proof. 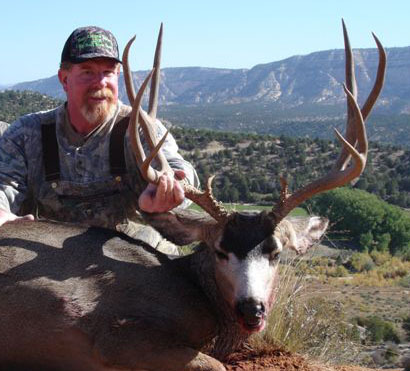 Mick Dover just sent in this photo of the buck he killed in Utah recently. Mick’s a member of our Livermore MDF Chapter and former Chapter Chair. 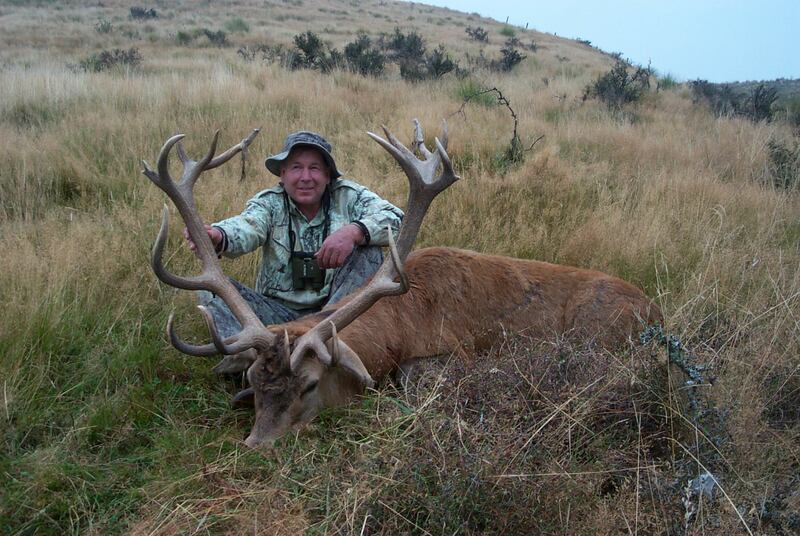 Nice buck Mick. For the first time in my life, I bought a landowner tag this year. I’ve been involved with the sale of many mule deer tags, primarily for The Mule Deer Foundation in the form of State Fundraising tags. The fundraising tags produce money for deer programs in their respective states. Caption: Here’s one of the bucks I decided not to pursue during the archery season. In Nevada, landowner tags are issued to ranchers and farmers to provide them an opportunity to be compensated for loss of income from wildlife encroachment upon their crops. My understanding is that surveys are done to determine how many deer are being supported by the feed provided (typically alfalfa). Then the landowner is issued one tag for every fifty deer using the ag fields for survival. Why buy a tag? This tag will give me an opportunity to hunt out of state and have a chance to bag a nice mule deer buck. It’s not guaranteed, but a very large buck could show itself. The landowner tag allowed me to hunt both archery and rifle seasons, a big factor for me. My archery hunt was also a scouting trip for rifle season. If you draw a tag in the lottery, it gives you the same rights as the landowner tag other than being able to hunt more than one season. I’ll focus my rifle hunting on the last ten days of the season when the chance of a big buck showing are greatest. I’ve never hunted Nevada with a rifle before so it will be a new experience. I looked over several tags before I made the decision to invest. The price of these tags generally ran from $2,500 to 5,500 each with a couple ranchers holding out for very big numbers. My guess is the average price was about $3,500. You can buy tags direct from landowners or you can contact various agents who promote the tags for a percentage of the sale. Assuming I do find a couple nice bucks to look over, I’ll have to decide when to pull the trigger. I hope it happens. We’ll find out soon. 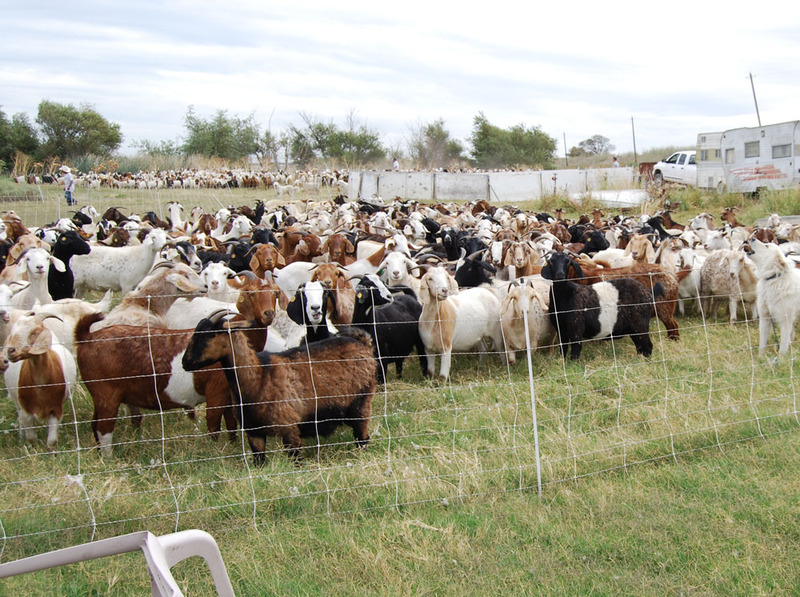 The goats are in and they’re doing their job. 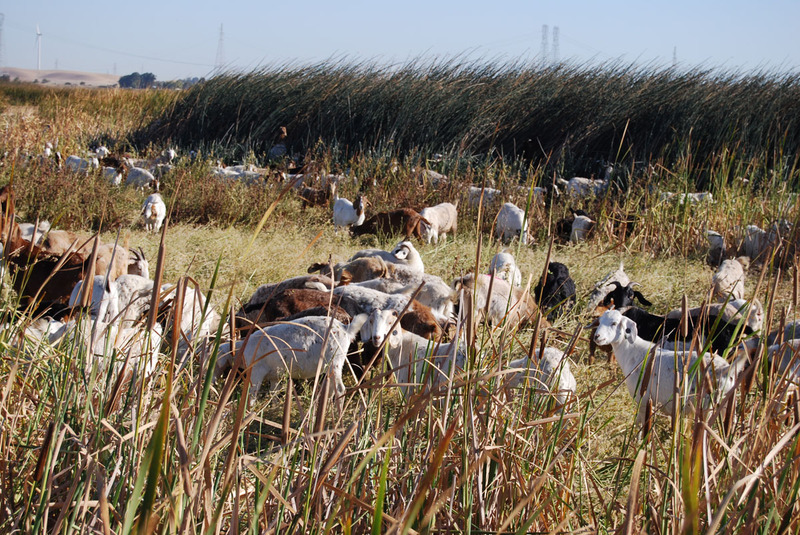 As many at 1,700 goats have been grazing on our duck club and they are removing much of the vegitation choking our duck ponds. 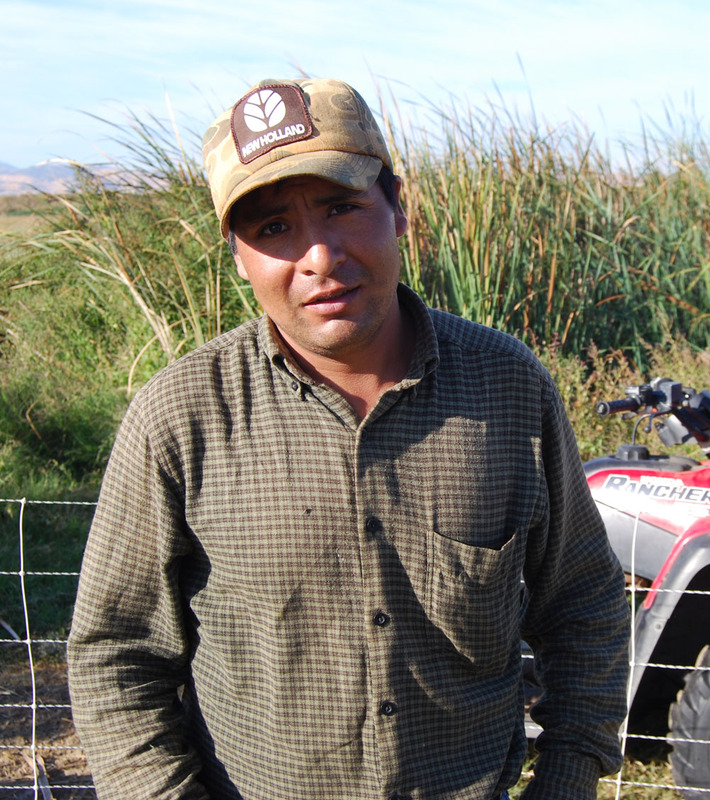 This is Walter the Peruvian goat herder. Talks about as much English as I do Spanish. 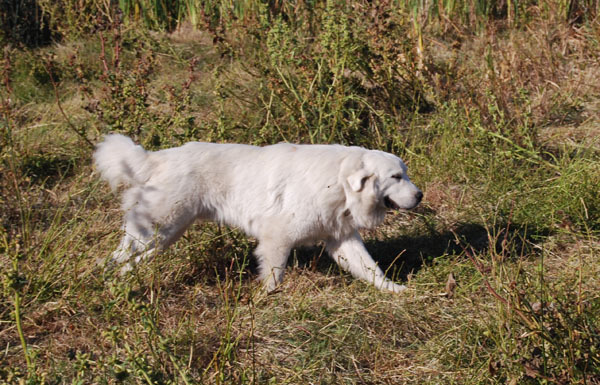 Walter says the great Pyrenees guard dogs make short work or coyotes if they bother the goats. Here they are in action thinning down our thick stands of cattails and alkili bull rush. Here’s one of our ponds as it is rising. 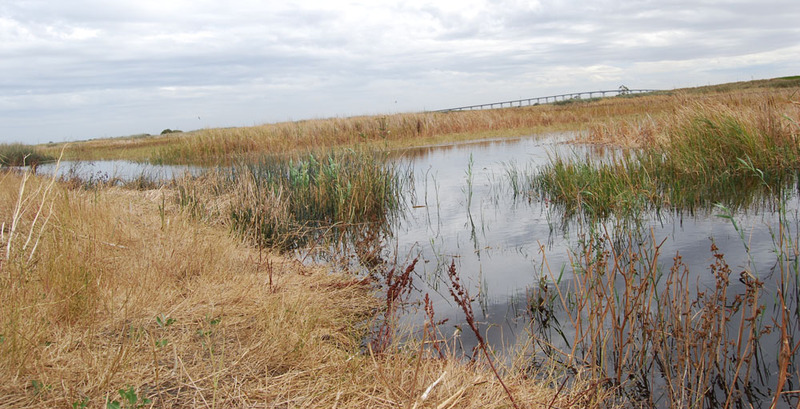 Water shows much better after grazing – should attract ducks. Not many ducks around yesterday, but a few sat on the edge of the flooded pasture to the north of us.